Could not install package 'LightMessageBus 1.0.0'. You are trying to install this package into a project that targets '.NETFramework,Version=v3.5,Profile=Unity Web v3.5', but the package does not contain any assembly references or content files that are compatible with that framework. For more information, contact the package author. To understand the issue, it's important to know that Unity builds on the Mono framework and doesn't really use .NET framework. To take this into account, the project in Visual Studio has a custom target framework set, which ensures that the right .NET framework subset is in use to make it compatible with Unity. This is quite a problem for NuGet which requires that the package being installed provides the assemblies for the projects target framework. Since it doesn't know anything about Unity's profiles, it requires the package to either provide an exact match with the target framework, or to contain fallback assemblies without a specified target framework. It's unlikely that you'll find many NuGet packages of the former type, so your only option will be packages of the latter type, which is not a recommended practice in the latest versions of NuGet. 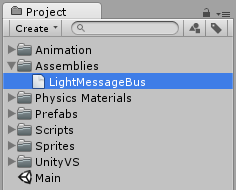 Assets/Scripts/Coin.cs(3,7): error CS0246: The type or namespace name `LightMessageBus' could not be found. Are you missing a using directive or an assembly reference? That's still not the end of all problems, though. 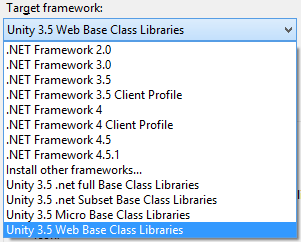 As indicated by the target framework, any assemblies used in Unity should be .NET 3.5 compatible, which automatically excludes any of the portable class library profiles. To make matters worse, there doesn't seem to be any information available on the exact version of the Mono framework being used in Unity 5 or its API compatibility. Previous version was supposedly based of Mono 2.6, and there was full documentation available on which parts of .NET framework are supported in which API compatibility level. Not to mention, that there was an option to select the API compatibility level, which corresponded to the available Unity target framework values in Visual Studio. 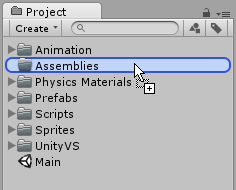 You've probably noticed it's the same error as when there's an indirect assembly missing from the Unity project. There's some additional stack trace available in both cases, but there's no information in it, which would help you pinpoint the cause of the error. You'll have to check yourself whether you've forgotten to reference an assembly, or is there an unsupported class being used.